Aside from the fact that this means that the VIRGO instrument actually works, which is great news, why is this a big deal? By adding a third gravitational wave detector, built by the VIRGO collaboration, to LIGO’s Washington and Louisiana detectors, the scientists involved in the search for gravitational waves now can determine fairly accurately the direction from which a detected gravitational wave signal is coming. And this allows them to do something new: to tell their astronomer colleagues roughly where to look in the sky, using ordinary telescopes, for some form of electromagnetic waves (perhaps visible light, gamma rays, or radio waves) that might have been produced by whatever created the gravitational waves. The point is that with three detectors, one can triangulate. The gravitational waves travel for billions of years, traveling at the speed of light, and when they pass by, they are detected at both LIGO detectors and at VIRGO. But because it takes light a few thousandths of a second to travel the diameter of the Earth, the waves arrive at slightly different times at the LIGO Washington site, the LIGO Louisiana site, and the VIRGO site in Italy. The precise timing tells the scientists what direction the waves were traveling in, and therefore roughly where they came from. In a similar way, using the fact that sound travels at a known speed, the times that a gunshot is heard at multiple locations can be used by police to determine where the shot was fired. You can see the impact in the picture below, which is an image of the sky drawn as a sphere, as if seen from outside the sky looking in. 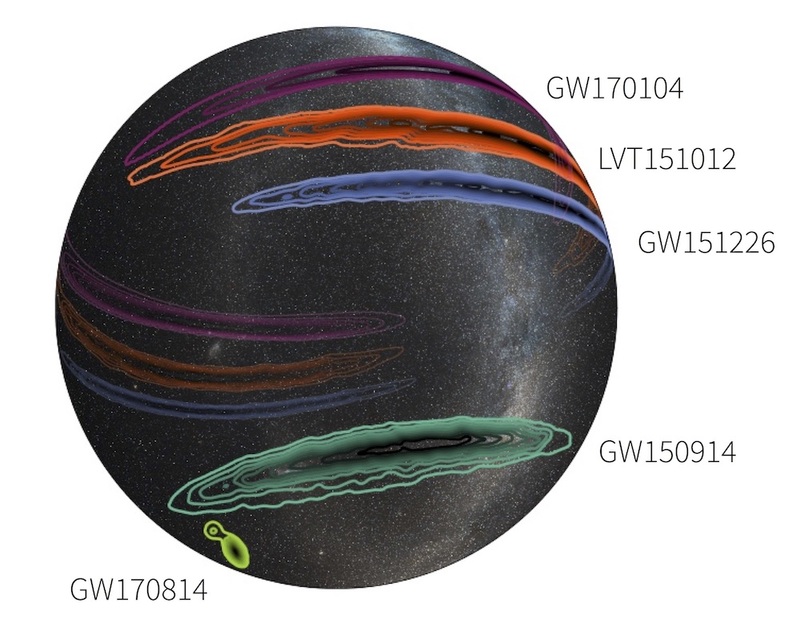 In previous detections of black hole mergers by LIGO’s two detectors, the scientists could only determine a large swath of sky where the observed merger might have occurred; those are the four colored regions that stretch far across the sky. But notice the green splotch at lower left. That’s the region of sky where the black hole merger announced today occurred. The fact that this region is many times smaller than the other four reflects what including VIRGO makes possible. It’s a small enough region that one can search using an appropriate telescope for something that is making visible light, or gamma rays, or radio waves. While a black hole merger isn’t expected to be observable by other telescopes, and indeed nothing was observed by other telescopes this time, other events that LIGO might detect, such as a merger of two neutron stars, may create an observable effect. We can hope for such exciting news over the next year or two. This entry was posted in Astronomy, Gravitational Waves and tagged black holes, Gravitational Waves, LIGO. Bookmark the permalink. Matt, these are great news! Not only that VIRGO is online with its latest upgrade, but also, that said upgrade is sensitive enough to detect G-waves just like LIGO does. With the three detectors working in tandem, as you have said, scientists can pinpoint to a small region of the sky as the origin of the event, and also, these detectors can detect and study the type of polarization that said waves have: this is important to be able to validate or refute the existing (and conflicting) theories on G-Wave polarization modes. Is it enough to pin point the galaxy of origin? If maybe GR waves are doppler shifted to also give a distance ? With only two detectors that are widely separated from each other on the surface of the earth, you can get a good approximation about the distance from the event to the earth, but you can’t get a good approx regarding the point of origin, but with three detectors that are widely separated from each other on the surface of the earth and they are also sensitive enough and have similar sensitibity and precision, you can both measure a good approx about the distance and the point of origin of the event. It would be interesting to observe gravitational waves from massive enough events so that a quantum gravity effective theory can be tested. An indirect constraint on graviton mass would start to introduce some new physics. Quantum mechanics remains weird: even gravity waves propagate at the finite speed of light (that’s why they can triangulate them indeed) and the entanglement is the only inexplicable nonlinear phenomenon of nature… If entanglement and gravity are connected by ER=EPR, it would be the case to look at a new GW detector with entangled photons created by a quantum squeezer. It would be great that the detectors could be able to capture the merger of two neutron stars large enough that when merged, the new body is massive enough to turn into a black hole, so, the detectors could capture the signals of a gravitational collapse while it happens: that would be a momentous event! I wonder: Since the release of energy from the merger is equivalent to about a bazillion hydrogen bombs, what would it be like to be near the event? Provided the black holes don’t have accretion disks, I can’t imagine any light coming off. But would we somehow “feel” the event if we were in orbit around the merging black hole pair? Oh definitely,and far before the actual merger. The holes are orbiting each other at a good fraction of light speed, even months before the merger. That much mass moving at that great a speed creates a massive amount of frame dragging; if you were close enough to the holes to be appreciably affected by their gravity it would be plainly obvious that something were happening just from changing tidal forces on you alone. And as the event approached the energy output would ramp up.I don’t know how far away you’d need to be to not be killed, close on a cosmic scale but definitely quite vast on a human one. 1) is the 3-rd GW detector coming any time soon ? 2) I wonder why speed of GW-s coincides with speed of light in vacuum, and can anything affect the speed of GW ? 1.) Technically VIRGO IS a third detector, though there are several more running now,all that is required is some upgrades to enhance their sensitivity, much as what happened with LIGO (And VIRGO) earlier. 2.) GWs are distortions in a fundamental field, gravity, and that field is associated with a force of infinite range (massless boson). They should thus be expected to travel at light speed as do both photons and disturbances in the EM field.. Thanks for explaining, I appreciate it. You are the 1-st one who did it. I feel a real relief and not that stupid any more. Considering a system of 2 BHs, there are 20 relevant degrees of freedom (position, distance, angular momentum, mass of each BH). Out of these, 5 degrees of freedom seem to only affect 2 observables (amplitude and frequency) without affecting the shape of the signal; is that actually the case and, if yes, what do astronomers do about this? The various DOF present various problems for detection. * Distance: Redshifting isn’t too much of a problem; LIGO and similar detectors have, if not a great range, than a broad range of frequencies they can detect. The shifting is not too great,though it is significant.The bigger problem is amplitude which can take an event that emits more energy than all the stars in the observable universe and reduce its impact to a distance change of less than a proton’s width. This problem required many improvements to our detectors to overcome. Velocity: Again this isn’t too big of a problem since the merger occurs at a good fraction of light speed at the end. As far as I can tell I think doppler effects aren’t actually detectable given the noise in the detections. This applies also to perpendicular velocity; the events themselves are so extreme that it’s difficult for any regular motion to impact their signal significantly. We’re only just able to detect them, we’ve seen at least one signal that was too noisy to be reported. Mass:distance: The mass of each hole provides a unique signature; the signal ‘decays’ when the two holes are touching (or roundabout) and the frequency at that point depends on the size of the holes (Mass relating directly to ratio.) This gives a measure of the combined mass of the holes and the asymmetry in the signal shows the ratio of the two hole masses. Heavier holes further away will inspiral at the same rate at lighter, closer holes; but their power output will be drastically less and the final frequency at the end of the ‘chirp’ will differ. Gravitational wave detection announcements talk about a blip lasting for a small interval of time. A cosmic event such as black hole merger that generated the waves should last a lot longer, and should continue to produce a stream of waves (just light a burning object produces a stream of light). Is such a stream observed? Well, to be able to get of grasp of things pertaining to any given physical phenomenon, we have to understand the differential equations that describe and explain said phenomenon. and those transients in particular last a zillionth of a second! Such a stream does exist; binary pulsars can be seen that are emitting gravitational waves that we cannot detect, slowly spiralling together over hundreds of thousands of years. The big problem is that the INTENSITY of the emission increases exponentially; as does the force of gravity itself over decreasing distance. The long ‘wind up’ is not seen, it’s just too weak for us to currently detect. What is seen is a ‘chirp’ of increasing frequency that quickly emerges from the noise, rises to a peak and then collapses at the point of merger. As detection sensitivity rises we should see more and more of the lead up, but it will be a long time before we can detect more than the last few seconds. In the figure above, there’s only a single splotch – how can we tell that the merger didn’t take place on the opposite side of the sky? Shouldn’t it take timings from four detectors to distinguish whether the signal is coming from above or from below (the Earth does little to attenuate gravitational waves, right?). Furthermore, all detectors should observe the same frequency and amplitude (taking their respective sensitivities into account of course) so no help there either. What gives? From both the amount of distortion (With identical frequency) one can detect the position of the detector relative to the wavefront and thus triangulate its origin. Confusing detection are possible,but should be reasonably rare for geometric reasons. Okay, so I was on the right track in my later post. A big thanks! Thanks for clarifying: existing machines already allow triangulation of GW. What about GW-propagation speed coincidence with speed of light in vacuum. Does it follow from Einstein’s general relativity ? Sorry, what did I clarify? There are two possible locations for the merger that produce the same delays between three detectors: one on either side of the triangle spanned by the detectors. How can these two be distinguished? The detector arms are in different directions though so their couplings to the signal are different. Does this provide enough information to constrain the merger location to a single splotch?